This is a special , tasty rice cooked in traditional style with tomatoes and grinded masala. Heat oil in a pan, add all the ingredients and saute them till golden brown . Grind them and keep it aside. Cook the rice with little salt and allow it to cool. Wash and chop the onions and tomatoes, split the green chillies lengthwise. Heat oil in a pan, add the mustard and urad dal,when they stop spluttering add the curry leaves. Add the chopped onions , saute till they turn translucent. Add the green chillies, saute for a min. Add the tomatoes , along with the turmeric powder and saute them until the tomatoes get cooked well. I can have this rice everyday, my all time favourite dish..
lovely rice...i make it w/peas. Wonderful presentation.. Awesome recipe.. thanks for sharing dear!! looks very yummy. nICE CLICKS TOO. i AM DROOLING. தக்காளி சாதம் எத்தனை விதமானாலும் செய்து பார்த்து சாப்பிட எனக்கு மிகவும் பிடிக்கும்.அருமை. Loved ur version of tomato rice. Mine is similar minus the coconut. Lovely platter. so well presented Aruna. A comfort food and a good entry for events. Dear,,simply superb tomato rice i like it very much paa ur's looks very fluffy n perfect tomato rice..
Love tomato rice...Beautifully presented dear. cute presentation & one of my favourite rice!! Tomato rice n potato fry combo has been my fav among the variety rice. Iam feeling hungry on seeing the platter aruna.Lovely click. Simply adore the tomato rice Aruna...Lovely click too.Yummy yummy.. Thank you so mcuh for sending to my event. My favorite rice. Love the presentation. I love this rice.....easy to prepare and yet soo tasty!This is the best variet rice one can ever have! I am looking for this kind of traditional tomato rice rather than the one prepared similar to biriyani...Thanks a lot for sharing this recipe :) I will definitely try it some time. Very yummy rice nicely presented. Last night I too made this rice. Yummy rice...pic are awesome..I luv the kutti tomatoes there !!! Tomato rice looks really yummy. I make more often. 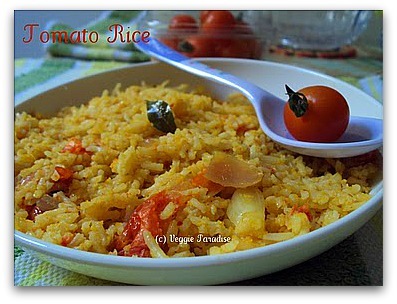 I love tomato rice..Yours looks so tasty, Aruna! Very Wonderful Rice. Such a nice recipe. Lovely and delicious and so beautifully presented and clicks.Looks mouth watering. my all time favourite..nice presentation!! Oh this rice looks yummm.. This is a lovely rice, and great click too. i love dis rice very much....nice presentation! ஐய்..இது நம்ம ஐட்டம்.எப்போ சாப்பிட்டாலும் போர் அடிக்காது.கலக்கலா இருக்கு Aruna. Lovely tomato rice and a beautiful click. I make a similar version but I add a bit of coconut. one of my fav dishes.. Delicious recipe, with just the right qty of spices. Congratulations on a brilliant food blogsite.